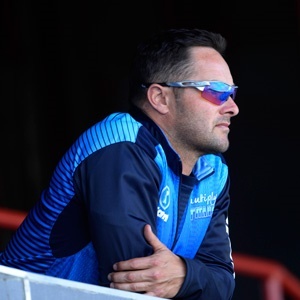 Cape Town - Titans coach Mark Boucher is adamant that his side has not lost any of the momentum or intensity they so impressively built at the start of the RAM SLAM T20 Challenge ahead of their clash with the Warriors at Willowmoore in Benoni on Friday. The reigning champions last played a game on November 19 when they overcame the Cape Cobras for a fourth win in succession. But in the fast-paced and tightly-scheduled competition, they had a match against the Dolphins washed out last Friday followed by another weather-hit game that saw no action against the Highveld Lions in midweek. Questions have been raised whether this will disrupt the almost invincible head of steam they had established, but Boucher was having none of it, insisting they are in the same space as they were a week ago. "No not at all (has our momentum been disrupted)," he said. "Everyone keeps talking about it, but I'm not sure why. "We train hard, we train at the right intensity with the guys hitting enough balls, so there's no reason why our intensity shouldn't be at the same level, if not better at this point of the season. "Yes, when you get on a roll, you tend to ride the momentum, but we got the momentum still, we're still unbeaten and the guys are all looking sharp. I think it's just media talk and it's rubbish." Boucher, whose side will effectively book their place in the semi-finals with a win on Friday, is expecting the bottom-placed Warriors to be under pressure for the clash. "It's probably a game that they have to win," he added. "So, they'll be treating it like a final and every game for them now will be treated that way I'm sure. "So, we'll expect them to fight really hard against us, they always do. And so even though they haven't been on top of their game, it will be close. "We're on top of the log still, so for us we don't need to play any frantic cricket, we can just continue playing our brand and at our pace, making the other teams do the running." The Warriors were beaten by the Cobras on Wednesday night for their fourth loss of the campaign and coach Malibongwe Maketa knows the stakes will be high in Gauteng. "Even though we lost, there were fine margins and we will try to make sure we can come out on the other side of those against the Titans," he said. "We know where we stand with four games to go. All four are finals. We've always done well in the past when we've had our backs to the wall and I don't see any difference now."